Original Editor - Matt Anderson. The achilles tendon connects the calf muscles to the calcaneus (heel bone) and is one of the important tendons in the human body. The main action of the achilles tendon is foot plantar flexion. Common pathologies include: tendinopathy, tear or rupture. Examples of mechanisms of injury for rupture includes: falling from a height, forceful plantar flexion of the ankle (as in jumping with an extended knee), or using the foot to break a fall if you stumble. Clinically they present with a palpable gap on palpation, increased passive dorsiflexion, lack of heel raise and a positive Thompson Test. Achilles tendon rupture is either managed conservatively with a cast or surgically with an achilles tendon repair. For more details on Achilles Tendon Rupture visit this page. There is much debate in the literature about treatment for achilles tendon rupture with the two options comprising of a conservative or surgical approach. Many studies have shown that the re-rupture rates are higher in cases of non-operative management. More recently studies have demonstrated equivalent or improved rates of re-rupture compare with surgical intervention. However, many people continue to be treated with surgical repair and physiotherapists will continue to see them for post-operative rehabilitation in their clinics. Visit the achilles tendon rupture page for information on conservative management. Prior to surgery general oedema reduction interventions should be utilised (Rest, Ice, Compression, Elevation). The surgery will ideally occur within one week of the rupture. Many techniques exist for this surgery, including transverse, medial and longitudinal incisions. 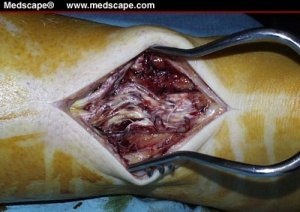 The ankle is placed in neutral position and the severed ends of the tendon are sutured together. The surgeon will then take the ankle through complete range of motion to look at the integrity of the repair. A cast is often applied, with the surgical technique determining how long the cast stays on. Many surgeons are now focusing on early weight bearing and passive motion to improve tendon healing. A new minimally-invasive technique involves utilisation of the peroneus brevis via two para-midline incisions. The technique reportedly preserves skin integrity over the site most prone to breakdown in a vertical incision, open reconstruction. Another study recommended percutaneous repair in the recreational athlete and in patients concerned with cosmesis, and open repair for all high-caliber athletes who cannot afford any chance of rerupture." Dutton describes three phases of post-surgical rehabilitation following achilles tendon repair. Phase I typically lasts three weeks. Phase II typically lasts from post op week 4-6. Phase III typically lasts from post op week 6-15. ↑ 1.0 1.1 Chiodo CP, Glazebrook M, Bluman EM, Cohen BE, Femino JE, Giza E, et al. American Academy of Orthopaedic Surgeons clinical practice guideline on treatment of Achilles tendon rupture. J Bone Joint Surg Am 2010;92(14):2466–8. ↑ Gulati V, Jaggard M, Al-Nammari SS, Uzoigwe C, Gulati P, Ismail N, Gibbons C, Gupte C. Management of achilles tendon injury: a current concepts systematic review. World journal of orthopedics. 2015 May 18;6(4):380. ↑ Willits K, Amendola A, Bryant D, Mohtadi NG, Giffin JR, Fowler P, Kean CO, Kirkley A. Operative versus nonoperative treatment of acute Achilles tendon ruptures: a multicenter randomized trial using accelerated functional rehabilitation. JBJS. 2010 Dec 1;92(17):2767-75. ↑ 4.0 4.1 Dutton M. Orthopaedic Examination, Evaluation, and Intervention. New York, NY:McGraw-Hill:2004. ↑ Carmont MR, Maffulli N. Less invasive Achilles tendon reconstruction. BMC Musc Dis. 2007:8(100). ↑ Bradley JP, Tibone JE. Percutaneous and open surgical repairs of Achilles tendon ruptures: A comparative study. AJSM. 1990;18:188-195. ↑ Braunstein M, Baumbach SF, Boecker W, Carmont MR, Polzer H. Development of an accelerated functional rehabilitation protocol following minimal invasive Achilles tendon repair. Knee Surgery, Sports Traumatology, Arthroscopy. 2015:1-8.